Summer - Bingsu Time!! - Experience It! It's finally summer!! Color is all around us and my spirit has been lifted by all the green leaves and flowers. It also means lots of fruit and of course on of my favorite things in Korea. - BINGSUUUUUUU and smoothies! 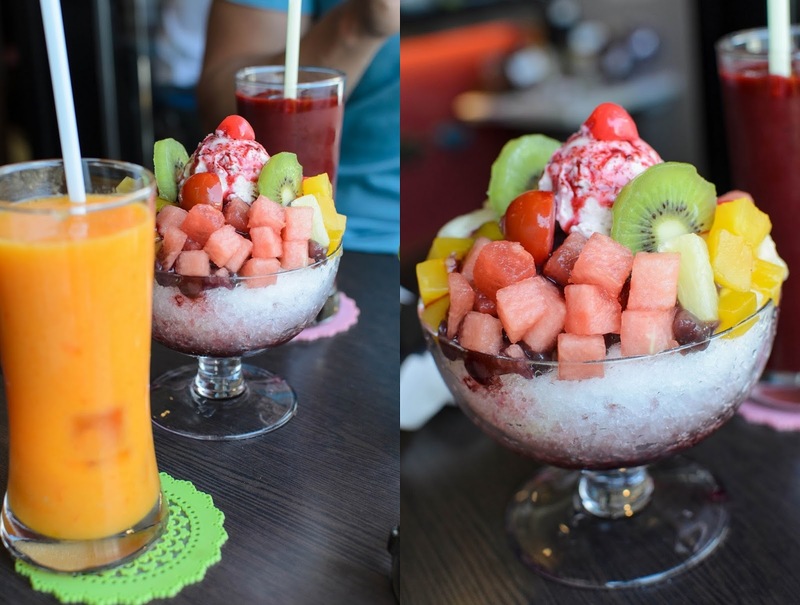 Originally Patbingsu - (Pat = red bean paste, Bingsu = Ice) - Patbingsu is a Korean shaved ice dessert, topped with all kinds of sweet things like red bean paste, fruit syrup, fruit, condensed milk, cream and or ice cream. Pictured here is just called Bingsu, because there is no red bean paste in this particular dessert. 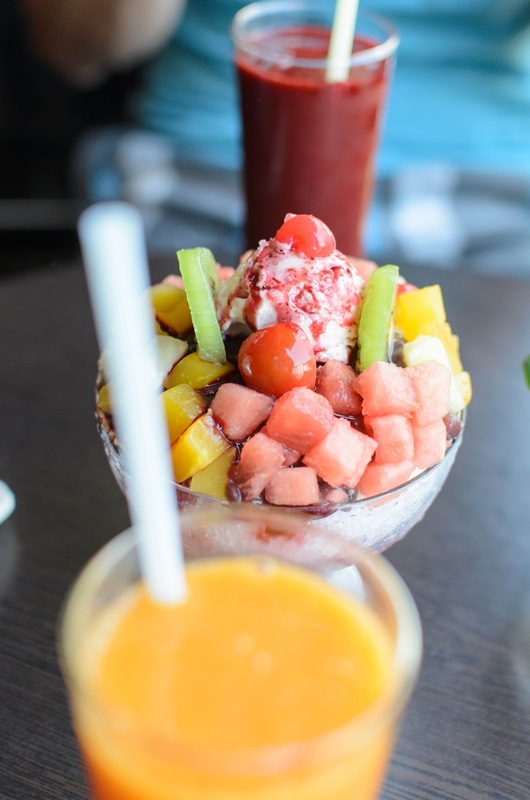 The shaved ice is topped with Kiwi's, watermelon, canned fruit and cherry tomatoes. Yes, here cherry tomatoes are added to fruit salads, which is just wrong, but you can just remove it. 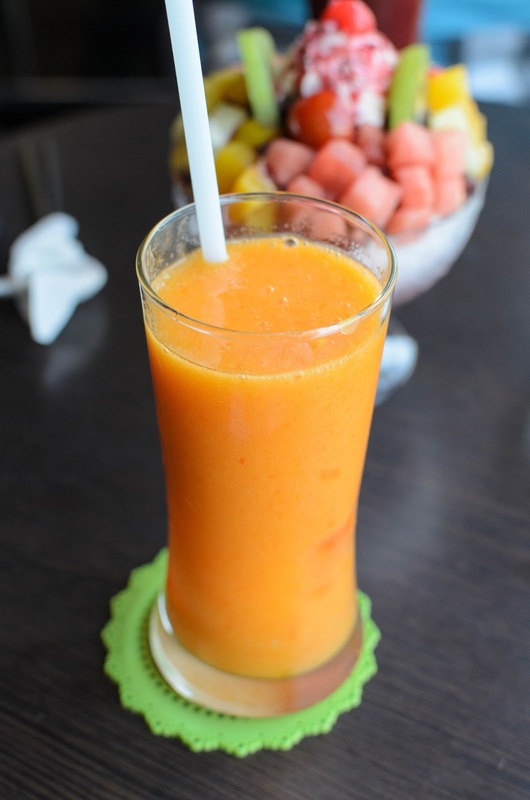 Also along with my fruit bingsu you can see a persimmon fruit smoothie. Persimmons are a big thing in Korea and is one of the world's top producers of persimmon fruit. I really love this fruit, that's why it was my first choice for a smoothie. This dessert is really delicious and cools you down in the hot humid summers of South Korea. When you visit South Korea, it's a definite must to find one of these cafes, which are all over the place. Do yourself the favor and try all of them, no matter how unhealthy it is, you can worry about going on a diet after your trip in Korea. Hope you liked my post - Please follow me for more great experiences from Korea. For more about Patbingsu, you can find a video and recipe to make your own Patbingsu from scratch. Here you can find the recipe and video for making Patbingsu - Maangchi makes all the Korean food at home herself and you can follow her step by step. Check it out.